It’s warm this morning and survivor leaves are raining down in droves. A Thursday morning in November, the newspaper is fatter than the last several months combined , to tempt us to prepare to shop. The Turkey Day Parade from New York is on the television. I am so grateful that it seems almost normal and yet there are so many in my home town and nearby that are wondering how they made it to this day and if next year will feel closer to their normal.This morning there are no turkey smells in our house. My husband is working this morning because the March of Dimes( his passion and employer) is coordinating a race to raise funds to prevent infant prematurity and birth defects. Later in the day ,we will visit friends because our children are far from home and for the past 25 years we have lived away from our family. Hopefully this doesn’t sound like whining, because I’m not sad. Holidays are so filled with expectation and tradition that it is too easy to get caught up in details and the way you “should” celebrate. When this holiday began, it was a way to share the food available and to appreciate others. Obviously in some ways it has morphed into a day of overindulgence, football and strategizing for shopping convoys. So where does this take me? A day to focus on what makes life fulfilling. For me it includes my family, the children I’m trusted with each day, friends near and far, the time to pursue creative opportunities, and the results of having taken a leap of faith with this blog and meeting so many new friends. The challenge to continue to write and post with some regularity is inspiring. The funny thing is that I sit at my computer with an idea and the words flow from the keys. I can’t explain how it happens but I am so grateful. It also lets me realize that as full as my life is, I need to share more and better. To meet needs that are unspoken and unnoticed , to give without being asked , these are areas in which I need to grow. 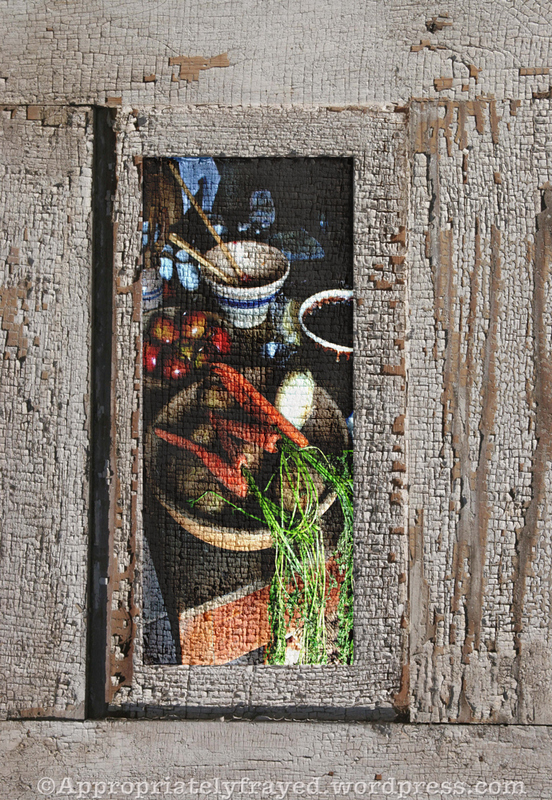 This photo I’ve posted is an old paneled door on which I’ve layered a photo of a colonial kitchen, a blend of the old to create something new. That opportunity exists for us each day. At our annual March for Babies to benefit The March Of Dimes, teamwork pays off! Even llamas know how important it is to walk for a cause. This is the Memphis March for Babies for the March of Dimes.